I must jog my memory before I write this review … what film was it I just saw? Was it Double Dhamaal, Rascals, No Problem or … err …? Was it directed by Indra Kumar, Anees Bazmee, David Dhawan or … err …? Hmm … tough one! Yes it’s finally happened. We’ve reached that stage in Bollywood’s slapstick comedy journey when one film has begun merging with the next and then the next, when comic devices are being repeated endlessly, and when it’s becoming difficult to distinguish one from the other. Rascals is the story of two rival con men who fall for the same woman. It’s okay for a few laughs here and there, but the truth is that I thought most of the gags fell flat! The reason is simple. If in Anees Bazmee’s 2010 release No Problem, Sanjay Dutt and Akshaye Khanna played crooks called Yash and Raj which led to jokes referencing Yashraj Films, here in Rascals Dutt and Ajay Devgn are called Chetan Chouhan and Bhagat Bhosle which of course leads to repeated mentions of (yes people, you got it right!) Chetan Bhagat of course. 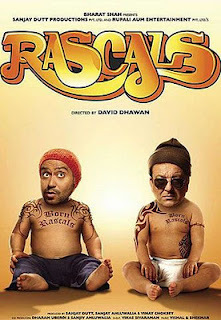 If in all David Dhawan’s recent comedies and in Bazmee’s blockbuster Ready this year, rhyming words and unimaginative puns were meant to signify humour, there’s more of the same in Rascals. The positives are that Devgn is growing as a comedian with each passing film; Ranaut too shows some potential in that department here (in a scene featuring a Ma Firangini – check it out); and Vishal Shekhar’s music is catchy for the most part. The negatives are that it’s sad to see Ranaut allowing a role (and Vikas Sivaraman’s camera) to be so focused on her bosom, considering that she seemed like such an interesting actress when she started out in Bollywood; it’s just as sad to see an actor of Devgn’s calibre devote so much time to films like Rascals when he’s capable of delivering a more refined comedy like Atithi Tum Kab Jaoge; and it’s almost tragic to see one of Bollywood’s original muscle men reduced to being a cinematographer’s biggest challenge as Rascals’ camera tries but fails to camouflage Dutt’s expanding girth which gets highlighted further by the fact that he’s standing alongside a slim, trim and fit Devgn and Ranaut in teeny clothes. Please, let me make it amply clear that I’m not against mindlessness. We all want to occasionally let our hair down and laugh without exercising our brains too much. Dhawan was once a master of that game and I guffawed my guts out watching Govinda and Karisma Kapoor’s shenanigans in Hero No. 1 and Salman Khan and Sushmita Sen’s antics in Biwi No. 1. But it feels bad to see a director take his audience so much for granted, especially when he still has it in him to deliver the goods. Dhawan has churned out a lot of poor quality fare since the good old 1990s, but somewhere in between all those duds, I enjoyed the craziness of Salman, Akshay Kumar and Priyanka Chopra’s tomfoolery in Mujhse Shaadi Karogi and the Salman-Sush combo in Maine Pyaar Kyun Kiya. Even Rascals features one scene that cracked me up – it involves a yogic pose quite inventively named Nagnamukhasan by Chetan Chouhan. That single scene may make you laugh till you cry. But when Antony Gonsalves (a third villain in this film played by hottie Arjun Rampal) mouthed a dialogue that suggests the possibility of a sequel to Rascals, I simply wanted to cry!